The purpose of implementing the Driver ID on your account is to easily distinguish between a single vehicle’s activity versus each driver in your fleet. With every reading that the tracking device sends in, it not only associates this with the vehicle, but will link it to the Driver’s Profile as well. A Driver may use multiple vehicles over the course of the week and with this system, rather than piecing together the information from each vehicle, you can run full reports for the Driver. This will greatly help to track their activity throughout the week to see which vehicles that they utilize the most, keep track of working hours, and their Driver safety habits. In the image below, you can see how our trusted Driver – Luke Skywalker – used two individual trucks throughout the week, but you still know which ones he used and where he went with them. Other reports include Speeding, Idling, Aggression, Timecard, and full Readings. 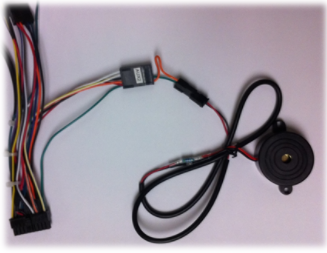 Driver ID Readers are available to wired tracking devices that have the 1-Wire data input (the LMU 2630, TTU2830, LMU 4230 and more). On most devices, this uses the same wire as Temp Sensor, so the two are not compatible together. Buzzer is connected to the two-wire connector on the main harness which consists of a Green and Orange wire coming from the AUX 2 input. It will “beep” when it registers the Driver ID key has been swiped. 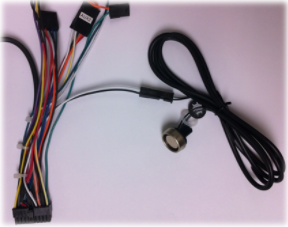 Driver ID reader is connected to the two-wire connector on the main harness which consists of a Black and White/Blue wire. Leave the ID reader in an exposed area so that the driver can swipe his/her ID key when they enter the vehicle. This is a two-part process that should only be done on devices that have the proper Driver ID reader and Buzzer installed into their vehicles. Create a Driver Profile in the Application: Click the “Drivers” suite tab in your application. On the far right-hand side of the screen, select the plus sign that says, “New Driver.” Fill-out your driver’s information and finish by hitting the “Add Driver” button. You should now see this driver in your fleet list. Automatically add the Key ID’s into your System: Your Driver Keys should have already been added onto your account, under the Driver’s tab and the “Driver Keys” sub suite. The identifier is engraved on the metallic part of the key. The identifier should be a twelve-digit number similar to: 00001667717H. They have not had a Driver Profile assigned to them yet. Assign Driver Profile to an ID key: Once you are on the “Driver Keys” sub suite showing all of your Driver Keys listed, click “edit” to the part left of Driver Key. Associate this key with a Driver Profile from your list and hit the “Update Key” button. Now the Driver is linked to this specific ID key! 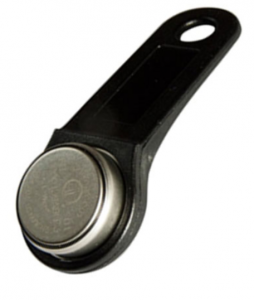 When a driver gets into their vehicle, they need to “swipe” their ID key onto the ID reader either 30 seconds before the vehicle ignition is turned on OR anytime after a trip has started (but not completed) and two short audible beeps will occur when that has taken place to let you know it’s connected. The driver will need to swipe the ID key each time they turn the vehicle ignition on. If no driver has been “checked-in” to the vehicle, the standard script for the device with a keyfob calls for two long reminder beeps to occur once at 15 seconds after turning on ignition, but we also could script it to happen every 15 seconds until registered or never at all per request.